The correct driving position is important for safe and fatigue-free driving. For your own safety, and to reduce the risk of injury in the event of an accident, we recommend the following driving position. 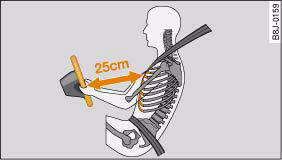 – Adjust the steering wheel so there is a distance of at least 25 cm between the steering wheel and your breastbone ⇒ fig. 199. – Move the driver's seat forwards or backwards so that you can press the accelerator, brake and clutch pedals all the way to the floor with your knees slightly bent ⇒ . – Make sure that you can comfortably reach the top of the steering wheel. – Adjust the head restraint so that the top of the head restraint is level with the top of your head ⇒ fig. 200. – Adjust the backrest to an upright position so that your back remains in contact with the upholstery. – Fasten your seat belt correctly. – Keep both feet in the footwell so that you are in full control of the vehicle at all times. For detailed information on how to adjust the driver's seat, see, “Seats and storage”. • A driver who is not sitting in the correct position or who is not wearing a seat belt can be fatally injured if the airbag is triggered. • Adjust the driver's seat so there is a distance of at least 25 cm between your breastbone and the centre of the steering wheel ⇒ fig. 199. • While driving, always hold the steering wheel with both hands on the outside of the rim at about the 9 o'clock and 3 o'clock position. This reduces the risk of injury if the driver's airbag inflates. • Never hold the steering wheel at the 12 o'clock position, or with your hands inside the rim or on the steering wheel hub. This could result in serious injuries to the arms, hands and head if the driver's airbag inflates. • To reduce any risk of injury to the driver during a sudden brake application or in an accident, never drive with the backrest tilted too far back. The airbag system and seat belts can only provide proper protection when the backrest is in an upright position and the driver is wearing the seat belt in the correct position. The further the backrest is tilted back, the greater the risk of injury due to incorrect positioning of the belt webbing or an incorrect sitting position. • Adjust the head restraint properly so that it can give maximum protection. The front seat passenger must sit at least 25 cm away from the dash panel so that the airbag has enough room to inflate and give maximum protection in an accident. – Move the front passenger's seat as far back as possible ⇒ . – Adjust the head restraint so that the top of the head restraint is level with the top of your head. – Keep both feet in the footwell in front of the seat. In exceptional cases you can disable the front passenger's airbag via the key-operated switch*. For detailed information on how to adjust the front passenger's seat, seegggggg 73, “Seats and storage”. A passenger who is not sitting in the correct position or who is not wearing a seat belt can be fatally injured if the airbag is triggered. • Adjust the front passenger's seat so there is a distance of at least 25 cm between your breastbone and the dash panel. • Always keep your feet on the floor when the vehicle is moving; never rest them on the instrument panel, out of the window or on the seat. 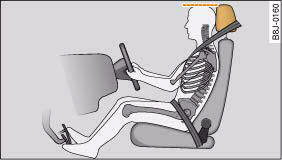 If you sit in an incorrect position, you increase your risk of injury in the event of sudden braking or an accident. If the airbag is triggered, you could sustain potentially fatal injuries by sitting out of position. • To reduce the risk of injury to the front passenger in the case of sudden braking or an accident, the passenger should never travel in a moving vehicle with the backrest reclined. The airbag system and seat belt can only provide proper protection when the backrest is in an upright position and the passenger is wearing the seat belt in the correct position. The further the backrest is tilted back, the greater the risk of injury due to incorrect positioning of the belt webbing or an incorrect sitting position. • Always adjust the head restraints properly for maximum protection. Rear seat passengers should sit upright with both feet on the floor and wear their seat belts properly whenever the vehicle is moving. – Keep both feet in the footwell in front of the rear seat. – Use appropriate child restraint systems for children travelling in the vehicle ⇒ page 210. 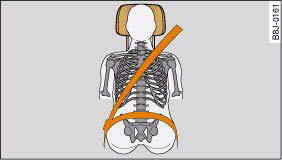 Rear passengers sitting out of position can suffer severe injuries. • Seat belts only offer maximum protection when the backrest is in an upright position and the passengers are wearing the seat belts properly. By not sitting upright, rear passengers increase the risk of injury due to incorrect positioning of the seat belt webbing. Properly adjusted head restraints are an important part of the vehicle's occupant protection system. They can help to reduce the risk of injuries in most accident situations. The head restraints must be adjusted properly to provide maximum protection. – Adjust the head restraint so that the top of the head restraint is level with the top of your head ⇒ fig. 201 and ⇒ fig. 202. For more information on how to adjust the head restraints, see. Travelling with the head restraints removed or incorrectly adjusted increases the risk of severe injuries. 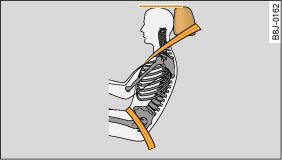 • Incorrectly adjusted head restraints could lead to death in the event of a collision or accident. • Incorrectly adjusted head restraints can also increase the risk of injury during sudden or unexpected braking or other manoeuvres. Occupants can suffer severe or fatal injuries injuries if they sit in an incorrect position while the vehicle is moving. Seat belts can only provide maximum protection if the belt webbing is positioned correctly. Sitting out of position greatly reduces the effectiveness of the seat belts and increases the risk of injury since the belt webbing is not worn in the position for which it is designed. The driver is responsible for the safety of all vehicle occupants, especially for children. – Never allow anyone to sit out of position while the vehicle is moving ⇒ . The following list shows just some examples of incorrect sitting positions which can be dangerous to all occupants. The list is not complete, but will help to make you aware of possible dangers which can be avoided. • never climb into the luggage compartment. Sitting out of position increases the risk of severe injuries. • Sitting out of position exposes the occupants to potentially fatal injuries: if the airbags inflate they can strike any occupant who is not in one of the designed seat positions. • Before starting a trip, sit in the correct position and stay in this position as long as the vehicle is moving. Before every trip, make sure all passengers are sitting in the correct positions and remain correctly seated at all times, “Seats and storage”.